I'm no expert on clothing, but after starting a necktie company, I did give it a lot of thought and read a few books. At least for a while, I was really interested in Savile Row and the history and process of making the world's best suits. I'm also a big James Bond fan and Bond wore Savile Row suits. Learning about suits and how they're made is interesting. Tailoring is a fine art and hopefully one that will not be lost on future generations. The recent history of fine tailoring and men's suits centers around the area of Savile Row in London. In the early 1800's they were known for military uniforms and clothing for royalty. In the late 1800's, Charles Dickens, Oscar Wilde, Dr Livingstone, and the Maharajah were customers of the Row. Around this time, increased demand from royalty caused Henry Poole and Co., Davies and Son, Meyer & Mortimer, and other tailors to outsource work to local sweatshops. Disease spread quickly in these crowded, unventilated rooms and the threat of it being passed on through the fibers in the clothing was the source of many major news stories. In the early and mid-1900's, the Row attired JFK, Clark Gable, Fred Astaire, Gary Cooper, Cary Grant, and others. More recently, it has seen Eric Clapton, Hugh Grant, British Prime Ministers, and countless others. While the tailors there are famously secretive about their clients, a few stories that are known show the Row has had a hand in the larger affairs of the world. In one story, the Shah of Persia [Iran], Mozzafar-al-Din, visited England around 1902 on the promise of receiving the Order of the Garter. King Edward VII refused to give this high honor to the Shah. A quick thinking Secretary had a special medal made that resembled the Order, but was missing the Cross of St. George. He and had it sent to the royal yacht just in time for the Shah's arrival. The King was so enraged by the sight of the medal, though, that he threw it out of his yacht's porthole. 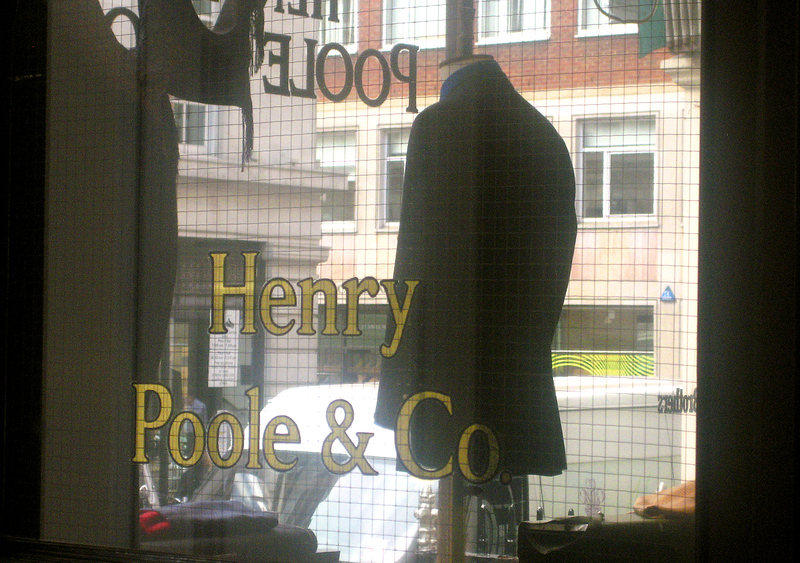 As a consolation, the Shah was introduced to the King's tailor, Henry Poole and Co. on Savile Row. (Although, a few years later, Britain sent the Shah a full Order of the Garter.) In another story, the 1973 French play La Cage aux Folles (on which the original French movie, and then later, the Robin Willams movie The Birdcage were based) caused a run on curled feathers which were used in their elaborate Savile Row-made stage costumes. This cause a few month's worth of backup in dressy military uniforms that also required curled feathers. Today, the Japanese call a suit a 'sebiro', which is their pronounciation of 'Savile Row'. The top-of-the-line suit, which is called bespoke ('bih-spoke') in England, is a handmade suit where you choose the fabric. The cutter then measures you, creates a set of individual paper patterns just for you (which can be used for later suits), cuts the fabric, and then they and the tailor assemble it exactly. A good tailor will prepare their pattern for you based on your 'figuration', which is the way you lean or stand. All suit jackets have 4 buttons on the end of the sleeves. Real buttons in button holes holding the end fabric of the sleeve together is a tell-tale sign of a bespoke suit. Most off-the-rack suits have buttons which serve no purpose, but are simply there for appearance. But probably you're not planning to spend $2000-$3000 or more on a suit. Unless you have the money to burn, you don't need to. If you do have that kind of money, it might be a worthy invesment to support the fine craftsment, like investing in the arts. Custom-made suits also fit better, are more easily altered over time, and last longer than factory-made ones, so ultimately they may be worth the higher price tag. A key thing to remember in buying a suit or any other part of your wardrobe is that there is a clear difference between flashy and simply well-tailored clothes that fit both you and your personality. The former is necessarily expensive, the latter need not be. For the latter, James Bond is my personal favorite style icon, especially for the British look which others, including the Italians, take their cues from. James Bond apparently preferred pleats. If you have pleats, your pants should be cuffed; if you have a flat front, your pant cuffs should also be flat. Cuffs on your pants should be exactly 1 3/4". If you have pleats, you should only have two on each side. Savile Row only tailors pleats that fold in, not out ('reverse' pleats). When looking at suits, the way one fits you and the quality and type of fabric used are the two most important elements. After that, the quality of the construction of the suit should be considered. One of the easiest ways to tell whether the suit is well constructed is if the canvas between the fabric covering your chest (called a chest plate) is 'hanging' and not 'fused'. In other words, it hangs freely between the wool and lining and is not glue to them at the seams. The best way to check is to ask (if the store doesn't know, assume not). Or online, there should be a description of the qualities of the store's suits and that should be one of the qualities highlighted. Hanging plates last longer, fit more naturally, and are easier to tailor. All Savile Row suits use hanging plates, of course. Find a good tailor to make sure your suits fit perfectly. The following are a few things that a tailor can adjust for you. Your jacket should be tailored to curve in so that there is a slight gap showing between your arms and chest when your arms are hanging freely. Your jacket's sleeves should be so that about a 1/2" of your shirt's cuffs extends beyond the jacket when your arms are hanging freely. The collar should be fitted so that after you shrug your shoulders up or to the back, after the jacket falls back into place, you don't see any of the material on the back of the collar. A tailor can make such alterations easily. Your shirt collar should stick up from the jacket collar about 1/2" inch. See this still from Dr. No for an example of a well-tailored suit (Sean Connery on the right) and a not-so-well-tailored suit (the American spy on the left). Also note Connery's jacket's cuff buttons: they're the real thing with matching buttonholes and not just there for decoration. There's a story that Fred Astaire had his tailor at Anderson & Sheppard pull back their carpet so he could tap dance in his new suit in front of a mirror to check that his collar didn't pull away from his neck. Wear your suit and shirts. If you take care of them (such as not wearing your suit pants without shoes to prevent the bottoms from fraying), they'll last a long time. Don't send them to the cleaners any more than is neccessary. But brand new clothes don't look as good as clothes that have developed a bit of worn-in character. Fred Astaire used to throw his new suits against a wall to 'knock the newness out of them'. According to one rumor, Connery's tailor for Dr. No made him sleep in his suit for a couple of nights to get used to it. Tall or short, heavy or slim? Here are a few tips from Alan Flusser's book Style and the Man. If you have any interest in this page, you should read his book for all the details. These are just suggestions, of course. You can break these 'rules' and still be just fine. Also if you're six foot, you're between short and tall, for example, so the difference doesn't matter much anyway. Although, in his book, Alan is most adamant about getting the shirt collars to match the wearer's face. Tall: Single-breasted, 2-buttons. Double-breasted that button on the waist, such as the 6 on 2, where the bottom 4 buttons are pulled slightly in and only 2 are buttoned. Flap pockets. Belts. Avoid stripes if possible, try houndstooth or herringbone instead. Short: Single-breasted, 3-buttons. Double-breasted that button below the waist. Suspenders. Heavy: Single-breasted, 2-buttons. Jetted pockets over flap pockets. Dark solid colors. For a rounder face, shirt collars should be longer and point down more. Slim: Pinstripes and windowpanes. For a long, narrow face, shirt collars should be spread out more. 8-10 ounces, usually wool, but also silk and linen. Consider linen for vacations, outdoor weddings, and parties, not around the office. Both 2 and 3 buttons. If you want a suit that can be worn year-round, this is the only option that will keep you cool in the summer. If you add a thicker undershirt and a vest or a sweater in the winter, that may be all the difference that is needed to add extra neeed warmth. Usual office temperatures, or slightly colder (60 degrees Farenheit). 100% pure wool worsted, 13-15 ounce weight. Typically blue or grey pinstripe or solid navy. Both double breasted (6 buttons) and single breasted (3 buttons). If you wear suits daily, you may need a couple of these. Best in cold outdoor temperatures. Suits are almost always grey or navy. Tan and shades of brown for a less conservative suit is OK. Until about 1990, black was not a traditional business suit color; typically it was reserved for dinner jackets or tuxedos. It is seen more nowadays. Black suits and black jackets look best on people with dark-ish hair and light-ish skin (although not black hair and/or pale skin). Black jackets and white shirts is a contrast that doesn't work well on the lighter-skinned: a black jacket and a light blue shirt is better. Olive is rarely seen and would never be seen in a bespoke suit, although that shouldn't deter you if it's your color. Black sport jackets with non-black pants are fine, although they obviously don't create a suit. You can use a black jacket as an opportunity to wear some more colorful pants than a suit would allow, such as olive or khaki. Never wear the same (or similar) color suit and pants unless they are a part of the same suit. Stripe shirts? They're OK with Marcello Mastroianni (right). For darker skin, choose shirt colors that contrast your own coloring. Flashier colors can work. Consider pink, white, light blue; avoid black, dark brown, green. Medium skin tone: dark blue, light drown, black; avoid dark brown, red. For lighter skin, choose more muted colors. Avoid anything vibrant or they will overpower your own coloring. Ties can be more colorful. Consider light/sky blue, brown, white and off-white, dark blue; avoid pink, orange, dark purple, red. Black and white can work, but be careful wearing too much black. 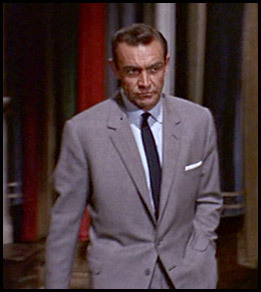 In the 007 films, Sean Connery wore lightweight wool (a favorite of Bond author Ian Fleming). Lightweight suits were not in style in the 1950s or 1960s, but Fleming acquired a liking for them after spending some time in Jamaica (where Dr. No took place). 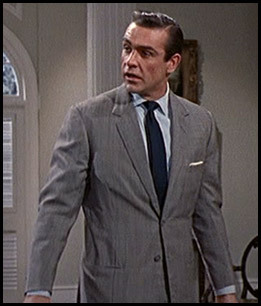 In Dr. No, he had a two-button, single-breasted, mid-grey lightweight suit made by the director's tailor, who had an office near Savile Row. It had a 'pared-down look' made by a slanted breast pocket, narrow notched lapels, and besom pockets (they look like thin slits that lie flat and unobtrusive on the fabric and have no flaps over them) just above the bottom button. This look is known as the 'Conduit Cut'. (Connery's tailor, Anthony Sinclair, had a shop on Conduit Street). In Dr. No, they have two vents at the bottom on the sides towards the back, although at least two of his suits in From Russia With Love (the light and dark grey ones) had only one in the middle. One vent in the middle is a sign of a cheaper suit; it's arguably better to have no vents. The two side vents are usually a sign of a higher quality suit. 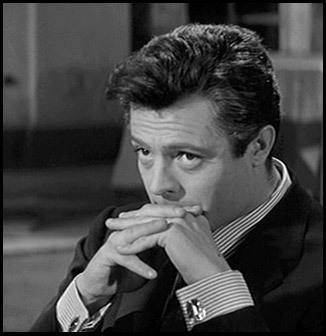 In From Russia With Love, he had four suits: a dark blue solid one and a dark grey solid one, which he wore in the opening scenes; a light grey 7-stripe glen plaid (note the detail on the jacket's cuff buttons in the photo) which he wore in Istanbul; and a navy one with white 1" pinstripes which he wore in Venice at the end. All four suits had flaps on the jacket pockets, instead of the besom pockets of Dr. No. 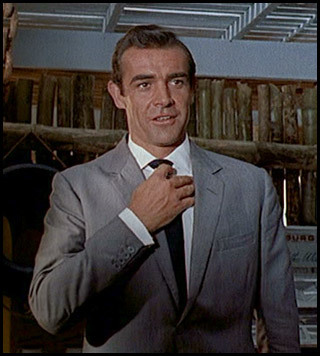 In Dr. No, Bond claims that his suits are made by his "tailor, Savile Row". Connery's shirts were made by Turnbull & Asser. Bond continued wearing these shirts until Brosnan wore Sulka shirts and ties in Goldeneye. Brosnan also wore Brioni shirts and custom-made Turnbull & Asser shirts and ties. In From Russia with Love, he mostly wore very pale blue ones with the grey suits and a white one with the navy pinstripe. In later films, Roger Moore and Pierce Brosnan took more liberties with Bond's clothing. Brosnan used an Italian tailor, Brioni. Although he kept some of the Savile Row touches, such as slim notched lapels and twin vents, his suits looked flashier but not quite as well-tailored. Anyone can put on an expensive suit, but Connery's Savile Row suits simply best complemented his and Bond's personality and character. If possible, have a tailor steam clean a wool suit, don't dry clean them. The chemicals in dry cleaning will ruin the fabric in the long term. Always clean all parts of a suit together so the fabrics always match if there's fading. Using a brush or a lint roller regularly on both sides of the fabric will help the fabric stay clean of dirt particles. You should only have to have your suits cleaned once or twice a year if you do. Wool doesn't absorb perspiration as much as cotton does, so dry cleaning every ten or twelve wearings should be fine. Don't iron wool (or at least be careful if you do and do it with low heat); it may damage the fabric. You can also try hanging your suit on your shower curtain rung and running the hot water for a few minutes to create steam. This can clean the wool and remove wrinkles. As much as possible, always wear all parts of a suit equally. Put on different pants when you get home and hang your suit up. Don't hang up the jacket and wear the pants. Remember the scene in My Blue Heaven? Linen should be hand washed and air dried. Over time, this will smooth out the fabrics. Iron carefully if needed. Dress shirts (which are cotton) should never be dry-cleaned. Ask a cleaner to machine wash them instead. No starch, it can stain the fabric over time. Instead use collar stiffeners. Hand pressing is best. Hang your ties and belts vertically. Ties can be rolled up to preserve their springiness, but it makes them harder to pick out of your closet and there's a chance they could become a little too springy- the 'Dilbert' effect. Don't iron neckties- it will flatten them. To remove a necktie, untie it, don't tug it off. Hang your pants as soon as you get home- don't wear them any longer than needed. Be careful that the bottoms don't drag on the floor when you're not wearing shoes. Re-inforce them if needed to prevent fraying. Be careful sitting on leather as it can shine your pant's seat. Use a lint roller. They're also suprisingly good for dusting off curtains, rugs, hard to reach carpet corners. When storing a suit for a long time, have it cleaned and then hang it in a cotton bag. This allows moisture in the air to breathe and stops moths from attacking it. For both double breasted and single breasted suits, button the top 2 buttons. Leave the bottom button undone. There's an easy way to remember this: the style originated from royalty who had to unbutton their lowest button after stuffing themselves at dinner. Tie your tie in a Windsor or double Windsor. When you pull the knot tight, cinch up the tie under the know in an M-shape and make sure it holds that shape as you tighten it. Then you'll get a dimpled look under the knot. They are located at #8 Savile Row in London. It is pronounced 'Kilgar', originally called 'Kilgour French & Stanbury'. They are one of the best and most appreciated on the Row with some pricing options that are about half of most bespoke tailors. They made Cary Grant's suits in the film North By Northwest. They made Hugh Grant's suits in Love, Actually. Hugh apparently introduced Noel Gallagher, Bobby Gillespie and Jude Law to them. They use Holland & Sherry cloths. As of 2006, a full bespoke suit costs about $4500. As of 2006, they also offer an 'entry-level' bespoke suit for about $2800 for the first suit (which includes a loose, pre-assembly fitting called a Baste fitting) and $2100 for future suits based on the template from the first. These prices decline when the dollar is stronger, of course. The same applies to sport jackets ($2000 for the first and $1500 for future ones). They visit major US cities regularly for fittings. The process takes 6-10 weeks. They are located at #15 Savile Row in London. They are one of the founding tailors on the Row and a favorite place of mine to visit when I'm in town. If you stop by, be sure to look for the check written to "Mr Poole" by the door from Charles Dickens (1861). Suits start at $3500 (in 2006). Read his blog and the archives with information about him: how he was given Mr. Anderson's shears (from Anderson and Sheppard) and many other interesting stories and insights. A lot of information about the bespoke process. He visits NYC every 2-3 months. About $3000 for a suit in 2006. Another good Savile Row blogger with lots of bespoke and tailoring information. They used to be #30 Savile Row but since moved a street over to avoid the sky-rocketing rent prices. More relaxed style but very old-fashioned and private. They made Ralph Fienne's suits in the Avengers film. Some have speculated that this was the tailor Ian Fleming had in mind when he wrote the James Bond books. 007 villian Count Lippe in Thunderball did wear a suit from them, but in the book, Bond was not very approving of his suit. Further, Bond, as an ex-military man, was more conservative and structured in his tastes, which are two traits that Anderson and Sheppard are known for not being. Prince Charles' tailor of choice (whether this is a positive or negative claim). Considered by some to be a bit too trendy and 'aloof' for a fine bespoke business suit. You're better off going with a good off-the-peg suit at a lower price and having it tailored exactly for you. TM Lewin. Jermyn [pronounced "German"] Street, London. Known for their shirts, which they have been making since 1898, but they also sell suits and shoes of very high quality. Note that if you buy a few shirts from the UK, the US customs probably will ignore them. But if you buy a couple suits, they'll charge you an import tax which could be about 20%. "I know a good tailor in Hong Kong" - Sean Connery as James Bond in 1971's Diamonds Are Forever. Manu Melwani of Sam's Tailor in Hong Kong. Clients include Bill Clinton, George Bush, Richard Nixon, David Bowie, Pavarotti, Prince Charles, George Michael, Pierce Brosnan, Whitney Houston, British PM Tony Blair, Kate Bush, and Jude Law. In 2006, suits can start around $500 and go to a few thousand. The shop is open 7 days a week and suits can be made within 24 hours, including two fittings, if needed. How the quality compares to the British bespoke, I don't know. I'm sure it's a good value for the money if you're in Hong Kong, although I wonder if the stitching can be the same quality as in a suit that takes a few months and a hundred or more hours to make, specifically in the buttonholes. He apparently made a suit for Prince Charles in under 2 hours: a true bespoke cutter/tailor couldn't even make the paper templates for you in that time or even sew the buttonholes on your cuffs. Just a point of comparison. Sam's may well make great suits, but be wary of choosing him strictly for this price: if you're going to spend over $1,000 on a suit, don't try to find ways to skimp on the extra few hundred. Bond wore a Rolex Submariner almost always, including in all of the Sean Connery films. Pierce Brosnan wore an Omega Seamaster. With a suit, usually white, or some shade of light blue. Occasionally light pink or purple if the carefully tie is picked to match. With a suit that is a solid color, you can also try a thin horizontally-striped shirt. Make sure your shirts are 2-ply 100% cotton. If they are see-through, then you'll have to wear a white undershirt. If your shirts are 2-ply, you can get away with not wearing one, although, especially in warmer months, it's recommended that you do to prevent deodorant and perspiration stains from ruining your shirts. Make sure you buy the thinest cotton undershirts available for the summer. "To measure your collar size, place a tape measure around your neck. At the front of your neck allow two fingers to slip easily between your throat and the tape measure. This should allow for a comfortable fit. But this is a guide so allow for personal preference." -T.M. Lewin's website (2006). Personally I think if you have to wear a shirt with a tie all day, it's better to have it be a little too big than too small, especially if you fall in between the 1/2" sizes. The same measurement also applies to shirts. If you're wearing or trying one on, the two finger check at the front of the neck can also be done with a shirt buttoned. My own experience is that cotton shirts shrink a little bit after the first washing and then a little more over the next few. Shirt collars are exactly measured when new and shrink between 3/8"-1/2" after a few washings. In other words, if you are between a 16" and a 16.5", always go with the 16.5". If it arrives too big, all you have to do is wash it a few times. Incidentally, washing cotton shirts will not age or harm them but they become softer and more comfortable over time. My tailor says that the sleeve lengths shorten over time too so he hesitates to shorten jacket sleeve lengths too much to fit shirts for that reason: if you want 1/2" of shirt sleeve to extend beyond the jacket, it obviously depends both on the jacket and shirt lengths. Make sure your shirt has a place for collar stiffeners in the collars. All Thomas Pink and T.M. Lewin dress shirts do. Buy a couple brass stiffeners. They come in many collar styles, but the two main ones are standard/classic and cutaway. The cutaway allows for a roomier tie knot, but the standard looks stronger. Thomas Pink. Jermyn Street, London -- but they are newcomers to the Street. This is a company that was started by two Irish entrepreneurs in the 1980s and only recently moved into an address here. They make very high quality shirts, but see the other names listed below for the 'real thing'. Stick with the formal/Black Label, standard collar, and mostly blue and white shirts. Supposedly a choice of Harrison Ford. A regular white shirt costs $140 (in 2006). All of their dress shirts are 2-ply broadcloth cotton and are very smooth after a few washings. The only complaint I have about their shirts is that they are cut too baggy around the sides. TM Lewin shirts, on the other hand, are much better fitted. This interpretation may depend on the breadth of your waistline of course. TM Lewin. Jermyn Street, London. Well known for their Prince of Wales collars which are a standard collar that are cutaway slightly. Prince of Wales collars are well-suited for a Half-Windsor knot. Their 'luxury' shirts are their smoothest and thickest cotton (the same quality as Thomas Pink's Black Labels). Their oxford weaves are a bit thinner, coarser, and a little cheaper. I believe that every April they have a 50% off sale of everything on their website. Note that their online prices include Value-Added Tax (VAT), so when you checkout, if you're in a country other than the UK, you'll get an extra 17% (or so) discount. Charles Tyrwhitt. Jermyn Street, London. Shirts are $100-$120 (in 2006) whereas Thomas Pink are $140. Very well-tailored fabrics. Their top-of-the-line shirts (the Sea Island or 'superfine'), are 180s twill with Swiss cotton woven in Italy and tailored in London; they are about $140 (2006). They also have a spring sale (25% off). Also note that their online prices include VAT, so when you checkout, if you're in a country other than the UK, you'll get an extra 17% (or so) discount. I think they are actually a new company too. Hilditch and Key. Jermyn Street, London. Make sure you get your neck and sleeve length measured and memorize it. Only buy shirts that are fitted for both lengths (i.e. 16.5/35); or at least know what the arm length is for shirts that are sold as '15.5/regular' or '15.5/long'. You may also find that even with the correctly sized shirt, the sides are too baggy. If you move around a lot in your job, you may need that extra room, but if not, it just won't look correctly sized and will get scrunched up under a jacket. If you're wearing a suit jacket, the shirt underneath should be as close to flat at all times as possible. A tailor can pull the sides of a shirt in for about $35 (in 2006) - a worthy investment if its needed. Connery's shirts were made by Turnbull & Asser. You have to buy them at their stores in London or New York. A regular white shirt costs $400 (in 2006). Button-down collars are not as formal. Look for standard or cutaway collars with room for collar stiffeners. The top of the back of the shirt is called a yoke. The left and right halves should be separate fabrics, joined in the middle. The pattern of the weaves should mirror each other in the middle, preferably where both angle downward at the shoulders. French (double) cuffs or button cuffs? Connery as Bond wore double (folded-over) cuffs that were held together with buttons, not cufflinks. According to a Turnbull & Asser tailor in the Dr. No DVD documentary, this was so it would make it easy for Bond "to put the shirt on and to take the shirt off". Ask your tailor about custom made shirts. Many tailors can send out your measurements to a shirtmaker after you pick the exact fabric and style that you want. A nice way to get a piece of custom clothing for a lot cheaper than a custom suit. Prices can run $200-$400. If you're in New York City, a well-known shirtmaker is Paris Custom Shirts, located at 38 W. 32nd Street. (3 shirt minimum for first-time customers). Always 100% silk. Stick with the basics, blue and red. The occassional yellow, gold, purple, or green tie if you think you can pull it off. Ties that match your eye color will draw attention to them; red and purple ties draw attention to your lips. Don't wear a tie that is too closely matched to your skin color: it will blank out your features. Other places, like Thomas Pink sell nice silk ties, too. You don't have to wear a solid color, but if you have patterned tie, make sure the pattern is subtle. Bond would unlikely to be seen in a polka-dot or large striped tie. Tie with a Windsor or Half-Windsor knot. They're stronger, more symmetrical, and more mature than the four-in-hand style you learned when you were a kid. Tie clips are useful in keeping your tie from hanging everywhere, especially when leaning over soup. If you want to look very formal, they shouldn't be worn, but they're a fine addition for the working man. RFK wore one. Some recommend you angle the clip downward slightly. There are many folding options, from a thin rectangle or slight triangle to a scrunched up look. They aren't seen very often, so the more conservative the fold and the less amount of attention it attracts, perhaps the better. James Bond occassionally wore a slight rectangle fold, called the TV fold (see the above photos). In his book, Alan Flusser advises against matching the pocket square exactly to your tie as it looks 'contrived'. If you tie is silk (as it should be), your pocket square should be cotton, linen, or wool. Whatever fold you use, the edges of the pocket square should show above your jacket pocket and the best squares have hand-rolled edges. The heavier your suit, the heavier the fabric of your pocket square should be, and vice-versa. Obviously the light fabric, silk, doesn't stay in place well; whereas a heavy fabric like wool can even be ironed into a semi-permanent shape. White cotton is the most conservative, corporate, and all-purpose choice. Mulberrywood make hand-rolled cotton and wool pocket squares. They also have a 'bespoke' option where you can send them the fabric and they will make the square for about $25 (in 2006). The also have a nice collection of handmade silk ties. Thin belts (about as thin as your thumb) are dress belts. Anything wider is casual. Shiny belts are more formal; leather that is less shiny is more casual. Personally I find that thicker belts hold up my pants better and sit more naturally. The color and finish of your belt should match your shoes. If wearing shorts, jeans, or anything casual, you can get by without a belt but always wear one if you are tucking your shirt in. Consider a white and blue striped canvas belt for casual clothes. Buy a belt that fits; don't punch holes in it yourself. Allen-Edmonds is a well-known shoemaker in the US; they also make some of the best leather belts. The waistline should be about 1" below your navel. The lower you wear your pants, the more you throw off the balance of the suit. If you have a separate sportscoat or jacket, wear pants that don't try to match the color. If the color between your pants and jacket are close but not exactly a 100% match in fabric, color, and style, it will look like a bad suit. Instead, consider pinstripe pants with a solid jacket. Or maybe a shade of light olive or khaki with a black jacket that you wouldn't ever consider wearing as a color in a full suit. A less formal jacket that is usually worn with a dress shirt and tie. A blazer is a sport jacket in a solid color; blue is the most common. Consider a sport jacket with a more casual or 'country' fabric look than you would buy a suit with, such as a British tweed or an olive windowpane. Shoes and socks both should be slightly darker than your pants. Leather soles are the most formal and match a suit best. Rubber soles can be more comfortable and quieter. If you get leather soles, you might find they are slippery when worn on carpet or tile. Go to Shoe Service Institute of America and find a store near you that can apply a thin rubber sole coat. Consider avoiding black socks. For navy suits, choose a dark navy sock; for grey suits, choose a charcoal grey sock. In his book, Alan Flusser suggests that if you have a dark colored tie, such as red or green, you can make a statement by wearing a similar dark red or green sock. Allen-Edmonds is a well-known shoemaker in the US. For nice shoes, store them with a cedar shoe tree to keep the leather in place, especially when traveling. Don't wear the same shoe more than one day at a time to allow them to dry. Use a shoe horn to protect the leather in the heel. Use a shoe polish occassionally and a separate shoe wax to protect them from water damage. Use a fine brush to apply polish and wax; buff afterwards with a shoe cloth to bring out the best shine. Store good shoes in cloth bags to prevent unnecessary scratching. Style and the Man by Alan Flusser. Savile Row: An Illustrated History by Richard Walker. The Indispensable Guide to Classic Men's Clothing by Christopher Sulavik, et al. Ian Fleming himself would call that fact Tom Ford is the Tailor for James ond an ABOMINATION! An American fashion house that is 5 years od is tailoring an iconic English man and the James Bond brand i also aan abomination! James Bn iss aan Englishman who happens to be a patriot who risks his lie every minute for his country! He would only wear Savile Row ad the besst English taiorring! Thank you for such a wonderfully thought out and well articulated informative article. By reading it alone, I feel like to own a SAVILE ROW Suit. One thing James Bond that Bond actually teach his all fans in his spy movies- that how to rock your suit even without trying too hard. Honestly i don't no much about suits and get rare chances to wear them but still i love each suit and want to wear them in a similar maner i am a huge fan of James Bond and his style sense. Thanks or yourr publish by the way! "One vent in the middle is a sign of a cheaper suit; it's aruably better to have no vents. The two side vents are usually a sign of a higher quality suit." This is ludicrous and baseless. A single vent is typical of American style suits and jackets. They are also not unknown in British and European tailoring, but are less common there. It has nothing at all to do with the quality of the suit. And unlike so mmany aspects of men's clothing, vents are actually functional. Those sitting, driving, or going on horseback (a pretty small percentage of jacket wearers these days) might pefer side vents. American professionals doing domestic business might prefer a single vent. I am probably not alone, as an American doing mostly domestic business, in casting a suspicious eye on Americans that emulate European style. It comes off as disingenuous; perhaps like American style in Italy might come off as bland (at best) or rustic. No matter where or what one's purpose is in choosing a suit or jacket, one should not be misled to believe there is a difference in quality of one suit/jacket versus another suit/jacket because of the vent. All text and pictures copyright © 2005-2006 Tim Darling.